What better way to take your daily biotic than by chewing a mint? 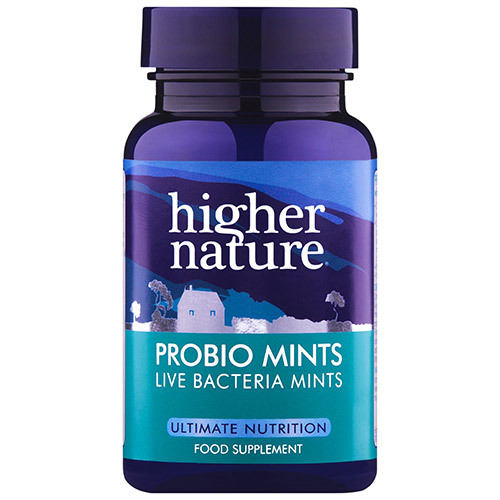 ProbioMints are made with Lactobacillus sporogenes, the same friendly bacteria as ProBio-Daily, currently our best-selling probiotic. Lactobacillus sporogenes because it has some very special properties: its `spore form` means that it will travel through the stomach without being decimated by stomach acids (while most probiotic bacteria are affected). Friendly bacteria do much more than counter the unfriendly bacteria. They also provide us with other, powerful benefits. Friendly bacteria manufacture vitamins and essential fatty acids. Aid in the digestive process by helping digest lactose (milk sugar) and protein. Clean the intestinal tract, purify the colon and promote regular bowel movements. Produce antibiotics and antifungals that help maintain intestinal health. *In the order of 50 million bacillus coagulans at the time of manufacture. Sweetener: isomalt; natural flavouring: peppermint; anti-caking agent: magnesium stearate (vegetarian source); anti-caking agent: silicon dioxide; bacillus coagulans. Adults: Chew 1 - 3 tablets a day. Children over 4 years: Chew 1 tablet a day. Excessive intake may cause a laxative effect. Below are reviews of ProbioMints - Live Bacteria Mints - 60 Tablets by bodykind customers. If you have tried this product we'd love to hear what you think so please leave a review. I gave these a 3 because these are a great way to give young children probiotics that tastes like a mint but what let it down was how hard they where so not so gentle on teeth. What better way to take your daily biotic than by chewing a mint. ProbioMints are made with Lactobacillus sporogenes, the same friendly bacteria as ProBio, currently our best-selling probiotic.